The new phone model of the Finnish company Nokia was unleashed quite a while ago. At that time its specs looked really striking. Today a color screen and a small weight are no wonder any more, though such phones are not widely available. On the one hand, the Nokia 7210 can excellently suit both a businessman's dress and roller skates of a reckless student. This handset has everything both may need. There are two things that catch you eye first of all: an unconventional keypad layout (in particular, side keys) and a color display (this is actually the first such phone from Nokia, 7650 is not accounted for :-) ). Many users point out that first two days they have problems in handling the keypad. Well, it really takes a certain amount of time to get used to the way the keys are arranged, but you will adapt very quickly. It took me only an hour to get used to them, and after that I could handle the phone blindly, especially because most keys have a unique shape. You can navigate the menu with a joy stick and two soft keys. The keys "right", "left" and "down" are combined in one swing button. The "up" key is a millimeter above it. Both soft keys, hang-up and call keys form two more swing buttons. I have no complaints about them: you won't confuse them in the dark. However, in the beginning I thought it wouldn't be handy to use this phone. The side buttons are made of hard rubber; the middle row, navigation keys and keys located on the side panels are made of an unknown material: it's too hard to be rubber and pleasant by touch which is not typical of plastic. The phone looks more angular rather than roundish. But a unique keypad design, small weight and tiny size distinguish it from others. You can also change its cover. We used the maroon one which is better for a business suit than for roller skates. The key function of any phone is to provide a high-quality connection. The Nokia 7210 copes excellently with it. A microphone is hidden near a connector for a data cable. If you speak over the phone in a strong wind quite often you will like the construction, because it this case a wind flow doesn't get into the mic and your friend won't hear any unpleasant hiss and whistle. The sound coming from the speaker in the standard mode is of very high quality. But in the handsfree mode the volume level is not enough, especially in a moving car. But luckily, the phone will be supplied with the headset. The connectivity provided by the transceiver is superb. We happened to test it in an elevator made of steel, a kind of that used for PC cases. It's interesting that in this elevator all phones we tested before (DECT phones from LG, Panasonic, Siemens and other models) lost connection soon after the doors got closed. The network connection indicator showed one point. First we thought it was a bug of the firmware or the phone was a slowcoach. But when we got stuck in the elevator and thought there was nowhere to wait for help from, one my friend called me. Of course, his voice wasn't heard perfectly, but other handsets refused to make any calls at all. We faced no connection problems in other cases either. I hope such top quality connection will be typical of the whole series :-). This handy device can produce various sounds and vibrate to attract your attention. Its polyphonic tones are inferior to the LG w5200, though they outperform the Sony J70. However, it's not fair to compare the W5200 and the 7210 as the former sports 40-instrument polyphony while our hero supports just 8. But even with 8 instruments the Nokia 7210 plays decently and rather loudly (as you know, some models with a polyphonic sound are very quiet). Apart from the ring tones the phone has a vibration alert. It's powerful enough, you can hear it even in a very noisy room. By the way, the phone vibrates in time with music! It perfectly feels when the handset is in the pocket. By launch of the official sales Nokia promises to make available on its site http://www.nokia.com/ special software (PC Suite 5) for loading new ring tones, logos, synchronization of the address book etc. :-). It will be possible to download usual midi files and special polyphonic ring tones. The phone also incorporates an FM tuner. You can listen to it only with the headset supplied, not through the speaker. By the way, it's not mono - it's stereo. The volume level might seem to be too high, though it comes in handy in noisy places. No doubt that such a powerful GSM transmitter, polyphonic melodies and color screen affected the rundown time. But even with all those features we could use the Nokia 7210 for two days: during that time we talked about 2-2.5 hours, installed and deinstalled a heap of java applications, some of them found via the WAP browser. The phone connected the network via the GPRS standard. We also used the IR port several times to transfer contacts. Well, I expected it to discharge much quicker. But when it wasn't used so actively it managed to work for just three days odd. At this test stage I noticed one bug: after 15-20 minutes of charging up a completely discharged battery the indicator showed 100%. I plugged it off, and the charging level started falling very quickly. Well, it seems to be one of the flaws of the preproduction sample; if you leave it to be charged for longer, no such problems will occur. The screen supports a high resolution (128x128 pixels) and 12-bit color (4096 colors). Such amount of colors could be seen on the popular Compaq iPaq 3600 PDA and even on the iPaq 3760 based on the PocketPC 2002. The screen displays bright and sharp images even in a very sunny day. In the dark the backlight doesn't seem to be too bright as well. After a week of using this Nokia's solution you don't want even the Sony Ericsson T68i. 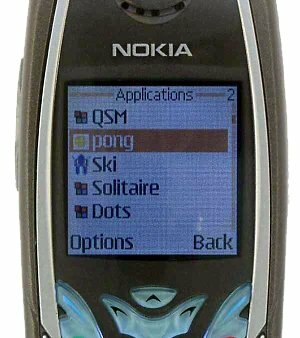 The only rival for the Nokia here is Samsung SGH-T100, but this device is of a different class as it has no IR port or GPRS and it's a clamshell). Let me just mention new items and changes. The first menu item got MMS (Multimedia messages) which can be sent and received. The gallery reminds me an explorer from a desktop PC. It lets us look through the contents of the phone's folders. The Applications item stores all installed Java applications. All programs were downloaded from http://midlet.org/wap/ (you can get here right from the cell phone). About 95% of all Generic programs worked perfectly here, including ICQ and a post client. All the stuff is very easy to use. We got a preproduction sample, and I hope that the production phones will lack all the drawbacks. First of all, I failed to find a menu item where I could adjust brightness. In a daytime it could be disabled at all as the colors are very contrast. Secondly, it's a bit complicated to change profiles. Here you have to press the power button on the upper panel (by they way, it's not easy to press it quickly), - you get into the menu where the first item is "switch off the phone". And only after that the profiles follow (I was always afraid that I could accidentally turn off the power). Besides, the clip of the battery compartment is not very handy. To remove the rear panel you have to pull down this clip with one hand and lift up the cover with the other. I got used to it only two days later. Well, the new solution from Nokia is hugely successful. At least, it copes perfectly with the functions specified by the manufacturer. Although it lacks a support for BlueTooth, a dictaphone and voice control, the phone leaves a quite pleasant impression.